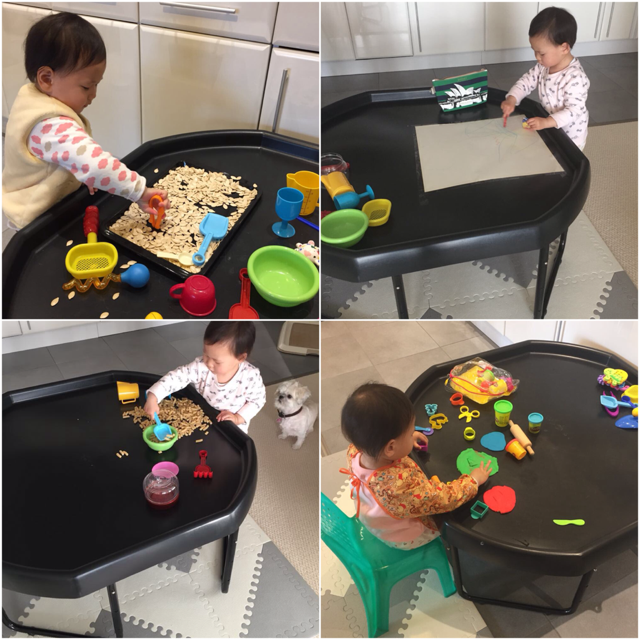 We are stuff loving our Tuff Tray and sharing more of our activities when the little was around 18 months to keep her busy. 1. Top left pumpkin seeds picking with huge tweezers. I dried these pumpkin seeds after Halloween and separated them so she can do more scooping / pouring. 3. Bottom left - scooping / pouring with pasta, as you can see we were at the stage of constantly scooping and pouring and she loved it! 4. Bottom right - this is always a favourite play doh so lots of rolling, cutting shapes and using the scissors. As you can see here she's not discovered mixing the different colours of play doh yet.